I just love this time of year with it's cool nights & mornings that slowly turn into beautiful still mild Autumn days. 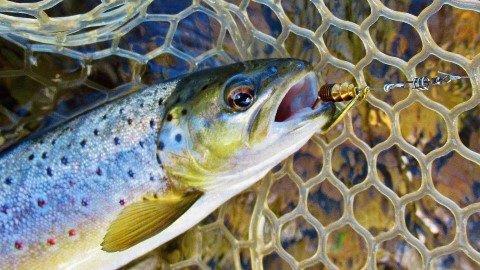 It's also a great time of the trout season for chasing trout in the rivers for me as well. It was another cool morning when I arrived at the Meander River for another spin session with the river still flowing at a nice wading height. 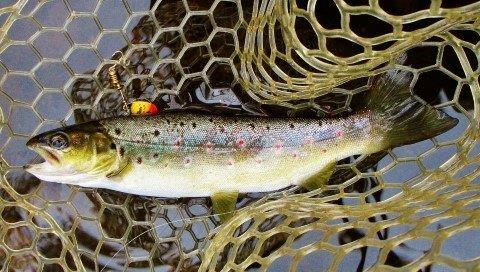 I started the session off with the lure that has done well on the trout over a few trips and that was the copper Aglia Mouche Noire spinner. The water temperature has now dropped to a cool ten degrees, I'm hoping for more good results like I had in this river on my last trip when I caught & released 15 browns. I was in the river by 7:20 am and it wasn't too long before I had my first trout take the spinner which was good, it was a nice 280 gram brown. Given it was a beautiful cool & frosty morning I decided to head off for an early spin session to see if I could catch three more trout to reach the 400 mark for this season. It's been a tough one for me so far and being around 120 or more trout down for the same time last season, reaching the 400 mark will make up for my poor season. Seeing as we had a Angling Club fishing day at Huntsman Lake at Meander I thought I'd get a few hours of fishing the Meander River in before heading to the lake. I was still dark when I arrived & headed off through the paddocks on a 1.5 km walk to where I was starting the spin session in the river. By the time I reached the river it was light enough to hop in and start fishing where I had a couple of follows from a solid brown at the tail end of a long slow flowing run. I tried several different lures but that fish just wasn't in an aggressive mood. The next stretch of river gave up nothing and it wasn't until I reached a nice narrow medium/fast flowing run when I had my first take. 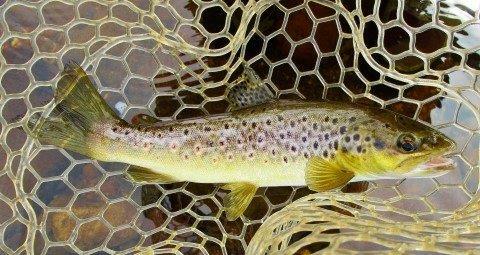 A small (280 gm) brown took the Mepps Aglia brown spinner from a cast & drift under the willows close to the river bank, I had my first trout of the morning. With some light cloud around this morning I thought I would head over to the Mersey River and have a short spin session before the sun burnt the cloud off. 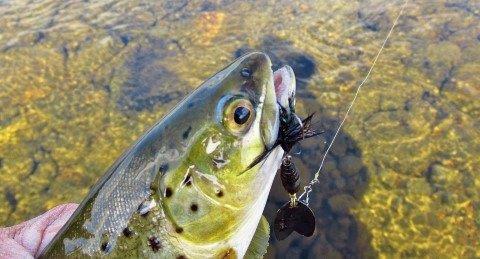 Conditions were quite nice with hardly a breath of wind and the river was at the perfect wading height. 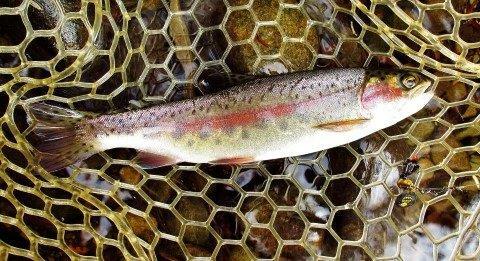 As I entered the river (7:40am) I noticed a few trout on the rise just ahead of me so I flicked the Aglia Furia well past the fish and retrieved the spinner back a little faster that the flow. Mild overcast morning saw me heading off to the Meander River for a spin session in a 1.5km stretch of river I haven't fished since before the 2016 June floods. When I last fished this area I averaged 15 plus trout each trip and most trout were all in the 450 gram range with many larger ones taken as well. 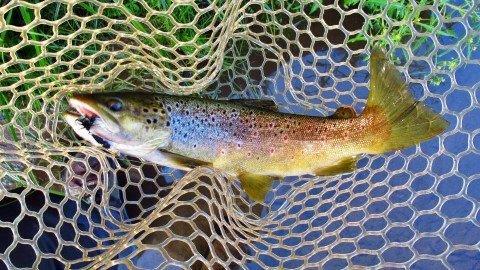 I wasn't expecting much today, I just felt it was time to see if the trout are back in this stretch of river. The rest of the river is slowly coming back with trout but they're mainly all small fish this season with the odd few reasonable fish taken from time to time. I hit the river at 8:05 am and had my first trout on within the first three casts up and across the fast water. I though a trip back to the Leven River may be worthwhile now the river level has dropped backed to a safe wading height after some heavy rainfall a couple of weeks ago. My last trip there was a good one with nineteen trout being caught & released, today the water level is lower than that trip was. When I arrived it was very foggy and the conditions were great, cool and not a breath of wind, just perfect for chasing trout. There were a few campers set up on the property where I started off the spin session, good thing was I had arrived at 6:00 am and they were still in their beds. 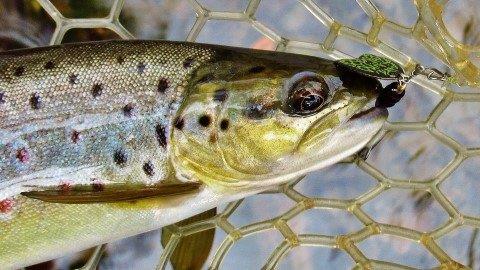 Took another trip over to the Meander River again to day to see if there was to be any improvement in the trout fishing. The forecast was good with light winds & a temp of around 21 degrees, I was in the river by 7:00 am & the air was damn cold as was the water temp. 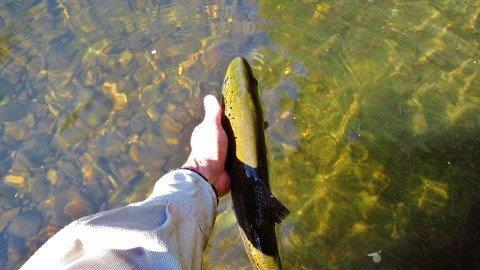 It was also running at 70 cms which is on the high side for wading but still safe enough when you know the river. 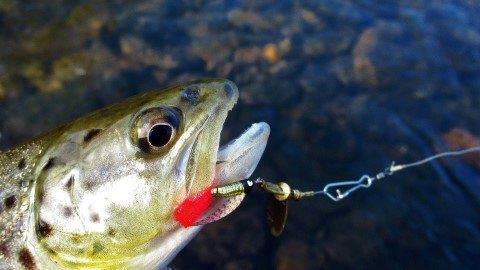 I started off with the lure that's been working the best in the rivers & that was the Mepps #1 Aglia Furia. I had a trout take it in the first five minutes and I thought I was in for a good day. I Headed over to the Mersey River and walked down through several paddocks for a good kilometre or so below the Union Bridge then started fishing my way back upstream. I haven't fished here for quite some time due to the lack of trout being in the river, today I mainly wanted to see if it has improved with trout stocks. The river was running at a nice wading height and a dark tanning colour. I started off with a Mepps #1 gold black fury working it in several fast water and medium flowing runs without a sign of a trout over the first two hundred meters of river. I changed over to the #1 Aglia Furia and the first stretch of water I used it in I had a couple of follows from brown trout that were mainly out of interest, not a sign of aggression from either fish. Then decided to try hard body lures in that same stretch of water, all to no avail as I never had a follow on any of the five different hard body lures I tried. 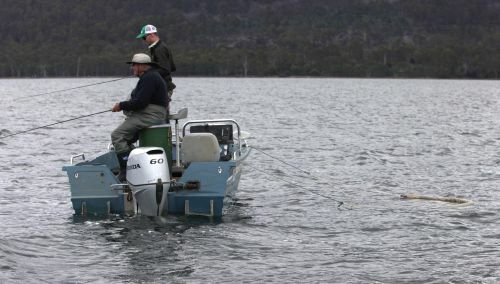 Sea-run trout fishing this year got off to a cracking start in most areas, with the majority of anglers employing nearly every trout fishing technique to secure fish in local estuaries statewide. 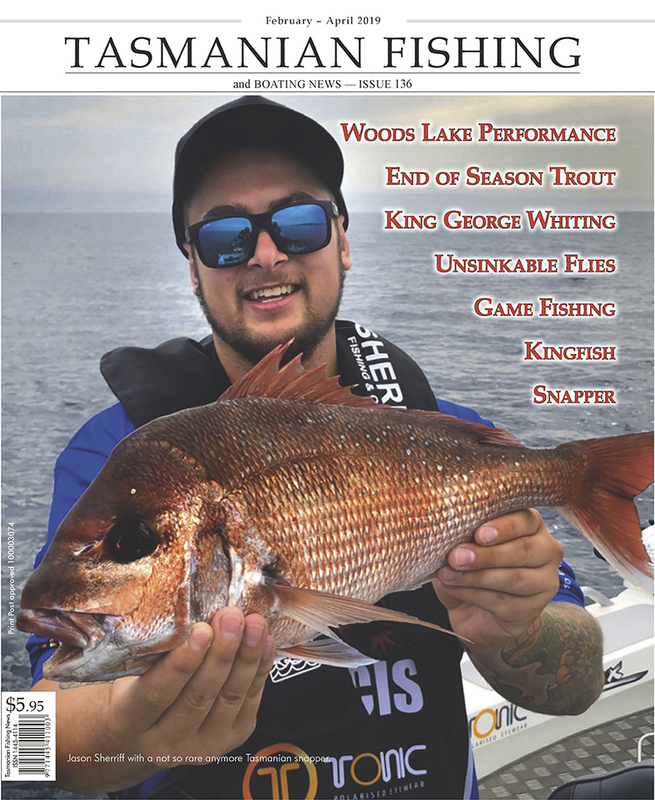 Even those anglers fishing the "off-season" lower down in our estuaries for sea-trout commented on the number of fish moving in early August.